It seems as though there are some watches for every day wear, and other watches for special occasions, and ne’er the two shall meet. Until now. The TAG Heuer women’s Aquaracer WAF1311.BA0817 is a watch that pairs Swiss accuracy with understated elegance. The result is a sophisticated every day watch that you can wear with literally everything. The mother of pearl dial is adorned with silver toned hour, minute, and second hands and silver hour markers at every hour. A date feature is located at 3 o’clock, and the bezel is inscribed with second markers. The bezel is also unidirectional, such that you can rotate the dial to start timing at any moment. The bezel and wristband are both fine-brushed stainless steel. The case is stainless steel as well, with polished edges and a screw down back, which helps ensure water resistance up to 984 feet. The fact that this watch is water resistant ensures that it can be worn in the shower or while swimming without worry. The watch also features a scratch resistant sapphire crystal window, which is important for withstanding daily wear. In short, this watch is both chic and athletic. It’s so durable and versatile, there’s almost no reason you’d have to take it off. From the pool to the boardroom, the TAG Heuer WAF1311BA0817 Aquaracer will work seamlessly. It’s also important to note that TAG Heuer watches have been lauded as some of the most accurate time pieces in the world, not only will you always be on time, but this will be the watch everyone else will use to set theirs. 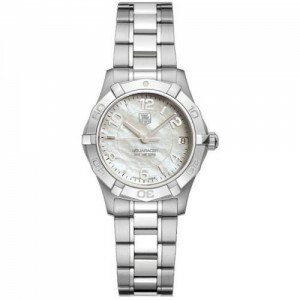 Despite being a small women’s watch, the dial is large enough to make this timepiece easy to read. That said, the watchband comes in a smaller size, which may not fit those built with larger wrists. The Aquaracer line by TAG Heuer has a number of takes on this model. There are styles with black dials, gold wristbands, or larger bezels, just to name a few alterations. As such, if there’s something about this particular timepiece that you could never live with, chances are there’s another watch in the Aquaracer collection that you can’t live without.